Honda has updated the Navi with CBS (Combined Braking System). Now priced at Rs 47,110 (ex-showroom Delhi), the CBS variant is Rs 1,796 more expensive than the standard model. Honda will continue to sell the non-CBS variant for the time being. Other than the safety update, the Honda Navi remains cosmetically and mechanically unchanged. 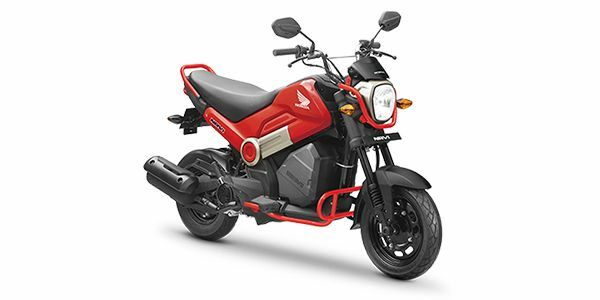 Honda Navi prices start at Rs. 45,314 (Ex-Showroom) and the top end variant Honda Navi CBS is priced at Rs. 47,428 (Ex-Showroom). Honda Navi is available in 5 variants and 6 colours. Share your experiences with Navi? The claimed ARAI mileage for the Honda Navi petrol is 37 kmpl. Limited range due to timy fuel tank. Q. Is it comfortable for a guy of 6 ft 3 inches? We would suggest you take a test ride of the bike as it is the best way to judge your riding comfort. Q. What are it's cons when riding in the city traffic ? How Is the suspension good & ride quality when going over bad roads & potholes? If we ride it for long trips, do we get back pain ? Q. IS IT VALUE FOR MONEY? WHAT UPGRADES CAN BE DONE? Q. It is gear or non gear? Honda Navi is equipped with CVT gear box. Q. How is the performance? Q. How to control accelerator of Honda Navi and use the front brake? I am a beginner and very short in height as 4'11. I keep losing the control on bike because of the accelerator? Always keep ur left hand on the rear brake.. it makes easy to control it's acceleration. With the convenience of a scooter and stance of a motorcycle, the Honda Navi is unlike anything you’ve seen or ridden in India before. The Honda Navi an adorable-looking bike. The square-shaped headlamp and the instrument cluster is all new. Bits like the indicators and the tail light are a hand-me-down from the Honda Stunner 125, which oddly work well to give this bike its funky persona. The new analogue instrument console in addition to the new fuel gauge offers basic readouts like speed, odometer and tell-tale lights for indicators and headlight high beam. The Navi gets switchgear that is familiar to Honda’s commuter motorcycles but there is no pass switch on offer. There are tonnes of accessories on offer as well, allowing the rider to customize the Navi to suit their personality. The Navi is powered by the same motor that powers the Honda Activa and the Honda Cliq. Power and torque figures produced are also the same as it generates 8.o3PS of power and 8.94Nm of torque. It gets upside-down telescopic forks up front and a single shock absorber at the rear. Braking is carried out by 130mm drum brakes at both ends. At 99kg, it is amongst the lightest two-wheelers on offer and comes with a 3.5-litre fuel tank. TVS Scooty Pep+: Launched back in 1996, the TVS Scooty with its petite dimensions and ease of use has remained a crowd favourite for many years now, particularly among the college-going crowd. The Scooty Pep+ came in with a refreshing design to further strengthen its positions among its fans. The Scooty Pep+ is not only more affordable than the Navi but also offers a lot more practicality with the comfort and storage space on offer. You also get a larger 5-litre fuel tank and the convenience of a floor board. Powering the Scooty Pep+ is a smaller 87.8cc engine that generates 3PS lesser power output. The Navi is a very fresh and unique approach by Honda to lure a younger audience. It is not everyone’s cup of tea but is still a great ride for someone looking to zip around the city and stand out of the crowd. It is a mini bike that is designed not only for the youth but also for the ones young at heart. However, bear in mind that it does miss out on the storage space that a more traditional scooter like the TVS Scooty Pep+ provides. That said, it offers the dynamics of a motorcycle with the convenience of riding an automatic scooter. I get 60-63 kmpl if we ride in economy speed.As navi is short nd light its very easy to maneuver in tight spots nd jam. Very comfortable but mileage is low. Sporty looks.